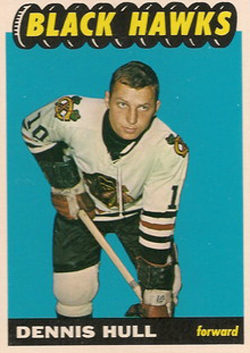 After using a larger size the previous year, 1965-66 Topps Hockey reverted back to the standard card size. They also expanded the set to include 128 cards, making it the largest hockey set the company had produced to date. A player picture is superimposed in front of a solid-colored background dominates the front of the card. Above his picture is a team name, spelled out in front of a series of pucks. His name and position are included in a strip that appears below the picture. 1965-66 Topps Hockey card backs are oriented vertically. At the top, the card number is included inside an oval shape, along with the player's name, position and team. A black box includes the player's stats from the previous season and a short biography in both French and English. Below that is a puck design, which includes a trivia question whose answer can be seen by rubbing the edge of a coin against it. Topps keeps the teams together numerically, but each team has two subsets within the set. Most head coaches appear in the set as well. Two cards feature checklists. Cards 123-128 feature team pictures and may have been included as a last-minute addition because they don't follow the same format of the base cards. They are not included on the second checklist card and are considered to be short prints. Due to the way the cards were arranged on the printing sheets, eleven cards were also double-printed. Notable rookies include Phil Esposito, Dennis Hull, Gerry Cheevers, Yvan Cournoyer, Ed Giacomin, Paul Henderson and Ken Hodge. The key card in the set is of Gordie Howe, who makes his first appearance on a Topps card in several years. Ron Ellis 1965 66 Topps Rookie Card#82 KSA 8 NM M Sharp!